Here is a funny wedding moment I captured last summer. It’s a photograph of a bride and groom at a wedding ceremony at Whitney Court in the Wye Valley. Now, this photo isn’t exactly flattering, as the bride has got her ring jammed on her finger and her face is all scrunched up. However, it’s a real moment. There is nothing forced or contrived about this moment. To me, this shot says so much more about the bride and who she is. 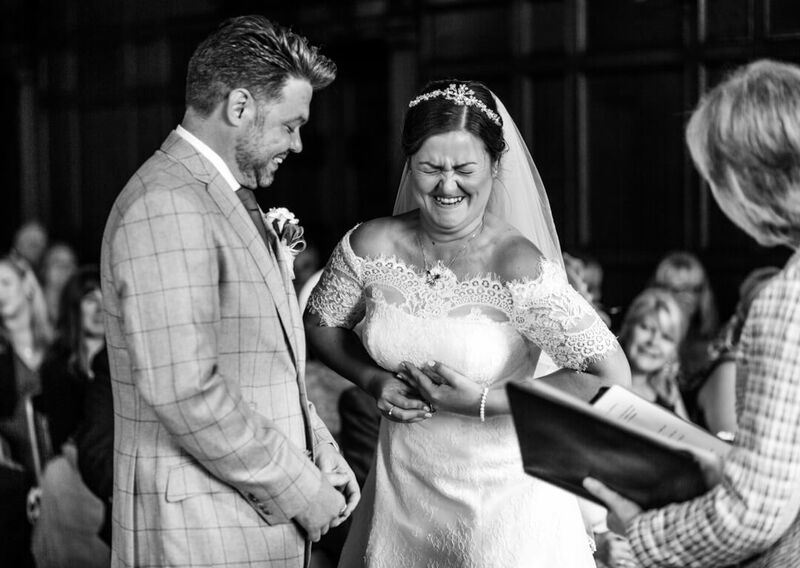 This particular bride is very carefree and bubbly with a quirky sense of humour. This image pretty much sums her up in a nutshell. So that’s why I love this photo! As a documentary wedding photographer, I’m always striving to get those special and unique moments. Every wedding has different people and different personalities and that’s what really makes their wedding unique. Here are a couple of quotes from two very famous photographers. These quotes go some way to explaining my approach to Storytelling wedding photography. Are you looking for a wedding photography? Looking for something different and unique? Looking for photography that captures the real you? Then get in touch, I’d love to hear from you. You can find more samples of my work on my website.